So you want to be a lector/reader. 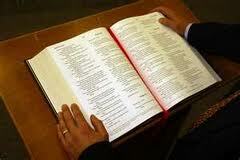 A lector/reader is a minister who reads from the Lectionary at Mass. In the General Instruction of the Roman Missal we read: “When the Sacred Scriptures are read in the Church, God himself speaks to His people, and Christ, present in His own word, proclaims the Gospel.” This Ministry is one of the great significance in the Catholic Liturgy, because you deliver the Word of God to the people. Sometimes, when a Deacon is not available, the Lectors/readers are asked to read petitions. We would like to give you some insight as to the process that we follow here at Holy Trinity, in becoming a lector/reader. The first step involves a "tryout", a process in which you and other prospective Lectors are asked to read before a group of current Lectors. You will be evaluated on such things as voice projection, enunciation, pronunciation and general public speaking attributes. The first meeting, if the prospective Lector is accepted, will offer training on the methods we follow in this parish to serve as Lectors. The new Lector will be assigned a mass to serve. Lectors will serve anywhere from once every other to twice in a three month schedule period. The frequency depends on the number of Lectors we have for the mass you have chosen to serve, 5:00PM Saturday, 9:00AM or 11:15AM Sunday. At this time, we ask that if you sign up for the Lectors Ministry, that you not sign up for another scheduled ministry, i.e., Eucharistic Minister, Greeter, etc., as we schedule independently and cannot coordinate the scheduling of various ministries. If you feel this ministry is for you or for further information, email or drop me a note, with your full name, address, telephone number, mass at which you would like to serve, and whether you have been a Lector before.